There are many opinions about where to install acoustic treatment panels in a home theater. You will not achieve the maximum improvement from the panels you have purchased unless you position them properly. It is a fact that fewer panels installed well can yield better results than more installed poorly. One key point to consider is the panels will work best if they absorb more of the reflected sound off the walls from your speakers that would reach your ears instead of less. 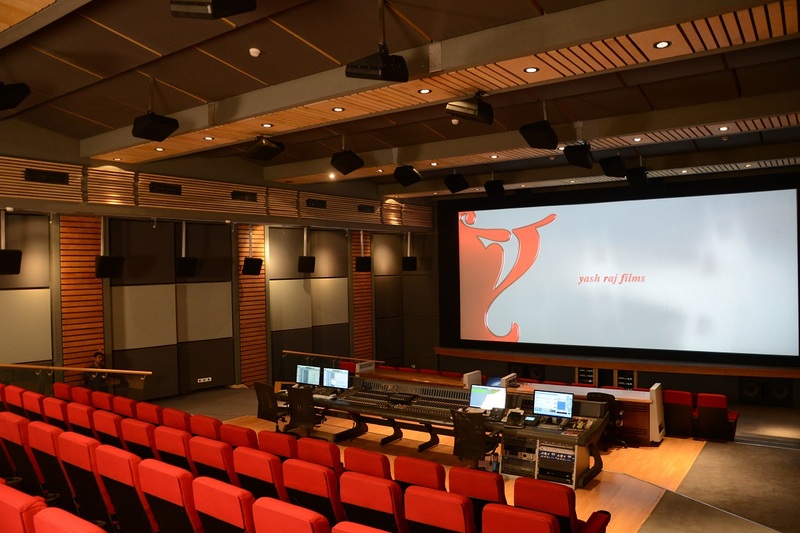 The second key point is the room acoustically should approximate a professional dubbing stage as much as possible. The closer your room comes to this the more likely it is you will hear something approaching what the rerecording mix artist intended for the film. Acoustic treatment will reduce the likelihood that sound will bounce around the room for an extended period of time. Sound absorbers will stop the sound that hits it at the frequencies it absorbs. A typical 2″ thick absorber is effective at absorbing sound at 250Hz to 20kHz. Sound diffusers will scatter sound at the frequencies they are effective making the sound reflections more diffuse. Sound absorbers are products with fibrous materials that dissipate sound energy that enters it. These must have free air flow through them to function properly. They can be installed behind stretched fabric walls or in panels that are covered by acoustically transparent fabric. Some panels are open in the back. When these are installed with an air gap between the wall and the absorber you increase their efficiency because they will absorb sound that impacts them from the rear as well as the front. Theaters will tall ceilings can install these suspended a foot or more from the ceiling to achieve more absorption. Panels that are not open on the back should be installed flush to the wall. A good method to install these is to use z-clips which screw into the wall and into the panel. These secure the panel so they do not rattle with loud sounds like wire hangers can. 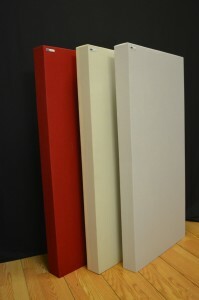 Absorbers can also be room furnishing instead of acoustic panels or insulation hidden behind fabric. These include things like upholstered furniture, books, drapes, blankets and tapestries. The larger and plusher the object is the more impact it will have on reducing sound reflections. Sound diffusers are products that are designed to reflect sound at different angles off of an uneven surface to prevent. 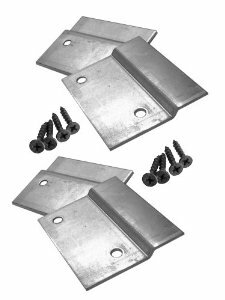 These are typically mounted on the wall or ceiling securely so they do not rattle with loud sounds. These can be hidden behind stretched fabric walls. Diffusers can also be any surface in a room that is not parallel to the opposing wall. Room features that achieve this purpose, but are not diffuser panels include tray ceilings, columns, vaulted ceilings or angled wall sections. One strategy mentioned frequently for locating room acoustic treatment is the concept of live-end/dead-end. I see this employed in home theaters by consumers and professionals alike, but it is not one that I find delivers the best sound quality. The concept used in these theaters is to non-symmetrically locate absorbers and diffusers either with the diffusers primarily on the wall opposing the front speaker wall or alternatively on the wall with the front speakers. This is a common strategy for music mixing, but it is not advisable for multi-channel sound reproduction. The practical results of this design philosophy are that it will increase the reflections from the rear of the room reducing the directionality of the surround effect along with dialog intelligibility. I have had many clients change their rooms from this configuration to a uniform absorption strategy and all have found it to be an improvement in sound quality. Many people are also unhappy with the strength of the surround effects in the theaters that are too live in the rear. I suspect some of this is related to the back of their theater room reducing the directionality of the sound from these speakers because it is too reflective confusing the direction of the sound. Note the photo below showing a professional dubbing stage where the absorbers and diffusers are visible. It is clear that the acoustic environment for the side walls and ceiling where the surrounds are located is very similar in nature. Also note the very high ratio of absorption to diffusion installed. A room like this will sound natural, but it will also be relatively dead acoustically compared to a typical living room found in a home. The quantity of sound absorption you should consider adding to your room will vary by room volume, materials of construction and furnishings. It is possible to install too much material in a room as well as too little. However, doing something to tame room reflections and coming up short is better than ignoring the problem completely. The benefits available from acoustic treatment also diminish as the room approaches a proper level of reverberation. A simple method for estimating the surface area of additional absorption to consider adding to your room would be to follow the recommendations from this calculator provided by ATS Acoustics. The products you add can either be in the form of acoustic panels or more natural furnishings like heavy drapery, ceiling tile and carpet. This is not always obvious. Some home theaters do not completely occupy the room they are in. When this is the case pay the closest attention to the region near the speakers, where the listeners are located and the surfaces between the listener and the speakers. Do not include sections of a room that are not part of the theater in the analysis for how and where to place acoustic treatment products unless sound from the speakers are likely to go into those regions and reenter the theater area. Surfaces that are more distant are not as important as those that are closer to either the speaker or the listener. For example, a wall 1-2 ft behind the listener is very important to stop strong reflections from this surface. When laying out acoustic treatment in a home theater it is important to consider all surfaces in a room. If your theater is carpeted with reasonably plush carpet you have effectively killed much of the ceiling to floor sound reflection problem. Other flooring materials can be much more problematic. The next best choice I have found to carpet is cork followed by wood and lastly tile or concrete. I would avoid large areas of exposed concrete, tile or glass surfaces in a theater if at all possible because these will reflect sound extremely well. When a flooring other than carpet is used some level of absorption should be applied to the ceiling to offset the more reflective flooring. Whatever material is used for the floor or ceiling it should be evenly dispersed across the surface. Drop ceilings can be effective at reducing ceiling to floor reflections, but these can rattle with the low frequencies found in action scenes. Additional treatment may be applied to the ceiling when carpet is present, but be careful not to over do it. The value of adding acoustic panels to the ceiling is dependent on the ceiling height and how close you sit to the speakers. If you sit closer to the speaker than the ceiling height to your speakers the need for ceiling treatment is lower than if you sit further from your speakers. If your surround speakers are positioned on the side walls near the ceiling some level of treatment on the ceiling would improve the sound quality of the room. Ceiling treatment will interfere with Atmos speakers designed to reflect off the ceiling if the surface where these point is not reflective to sound. Diffusion also works very well on the ceiling when carpet is on the floor. The vertical wall surfaces are the most common location to place acoustic panels and the most important if your room is already carpeted. The most common panels for the home are 2’x4′. This is a very good size to cover the reflections found in most home theaters. Getting the best performance from these products requires positioning them properly. Most of the reflected sound that reaches your ears will be on a level with the speakers and your ears from the front speakers. To stop these the panels should be mounted with the bottom of the panel slightly below ear level for the lowest listener. I find absorption placed very high or very low on the side wall is less effective than that mounted more in middle of the wall. I have worked with theaters where the room was lined with sound absorption mounted like wainscoting around the room significantly below ear level. The sound quality sitting in a chair in these rooms was not great, but if you sat on the floor where the acoustic treatment was absorbing the reflections the sound was much better. 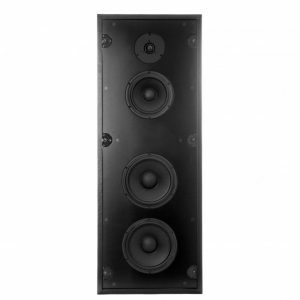 A big exception to mounting the panels mid wall is if you have a speaker that radiates a high percentage of sound to the rear as well as to the front of the speaker. 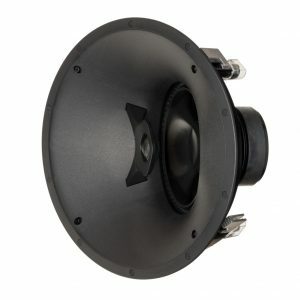 Speakers that have this characteristic will need sound absorption mounted directly behind the speaker to avoid the reflection from being too strong. Products like this are panel ribbon speakers and electrostatic speakers. Vertical wall panels should also not be located behind furniture or other obstructions if possible. It is best if all of the surface area is in direct view of the tweeters that are facing that wall. Seating that is near (0-3ft) a wall opposite speakers should have sound absorption located behind the closest listeners to minimize strong reflections. When installing diffusion on the side walls it is best alternated around the room and not focused heavily on one wall versus another. Bass traps are designed to absorb mid bass for the most part. These products are best located in corners. They should also be in direct view of the tweeters if possible so they can impact high frequencies as well as low. 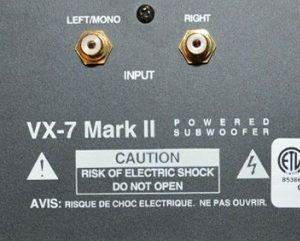 These products are not very effective from 20-40Hz where reverb can be very high even in a treated room. The lowest octave performance is dominated by how well the room is sealed for bass or dampens it with wall sections that flex to absorb the energy. It is also important to consider furnishings when specifying bass traps. Plush leather furniture will selectively absorb mid bass like these products. I find it very common that people with bass traps are over absorbing 125Hz because their furniture was already doing what was needed. An over emphasis on bass traps can result in a theater that under absorbs above 1kHz. The best theater designs consider all frequencies. If you are only going to do limited treatment the most benefits are from 250Hz and above. Theaters with front projection may have acoustically transparent screens. These screens are either woven or perforated to allow sound to pass through it from the speakers. It is very important to heavily treat the area behind the screen to minimize sound distortions from strong reflections behind the screen to the wall. THX recommends 1″ thick black coated Insul SHIELD for this application. Do not leave the paper on the screen side of the insulation. When your theater is proper acoustically you should be able to clap your hands near any speaker and not hear a strong echo. When speaking near these locations your voice should not exhibit a strong echo. Once the theater is reasonably dead acoustically you will have minimized the problems with sound reproduction that are aggravated by a room that is too reverberant. These include poor dialog intelligibility, weak surround effects and harsh sound reproduction. I would also consider the purchase of acoustical wall panels. This will eliminate the reverberation in the room and give it that unbelievable movie theater quality. creativewallexpression.com has the most stylish panels on the market. Another great option for acoustic panels is Mixmastered Acoustics. Hand built in the USA by professional woodworkers and designed by top notch acousticians. What really makes the room pop are custom art panels were you can have an image like a movie poster or a family picture printed directly on the sound panel. Really its nice information sharing article. I am sure we can treat room for high fidelity listening and mixing from your blog. Yes we can use different acoustic treatments for reduce or remove the unnecessary noise coming to our ears. This is some good information about making your acoustics better in your home. It does seem like a good thing to have a professional help with that. After all, it does seem like a good idea to have good sound in a theater. FabricAcousticPanels is a professional acoustic products sales processing enterprise, an innovation enterprise with development of design, production, sales and service. Our company has the experienced researchers, continuous innovation, production and sales of fabric covered walls and ceiling products, meticulous management mode, novelty design and superior quality. The products has been exported to more than 40 countries, which include São José dos Pinhais Brazil, Columbia United States, Saarbrucken Germany, Medellín Colombia, Ho Chi Minh City Vietnam, Naples Italy, Newcastle United Kingdom, Helsinki Finland, Rotterdam Netherlands, Lisbon Portugal, Stockholm Sweden, Indianapolis United States, etc. FabricAcousticPanels is guided by the propose of to the quality of survival, in good faith and development, innovation face challenges, best service face competition. Our goal is be with the world and make the highest quality sound absorbers and fabric acoustic panel in China, and we will provide every customer the most assured of the fabric acoustic product, the best quality service. I’ve always wanted a home theater so I might start by buying some commercial grade bamboo acoustical wall panels to make the basement quiet. If it will reduce the likelihood of sounds bouncing around the room, I’ll have a functional room in no time. As long as I don’t install too much material, I should have some great sounds in the theater room. Thanks for helping me understand that acoustic treatment will be able to keep the sound from bouncing while extending for a long period of time. With that in mind, I will be picking this for the home theatre so that the sounds will be great once we watch films there. We should hire a professional to choose the best treatments for the size of that room in the house since it is the biggest to really give the feel and ambiance of a real theater.